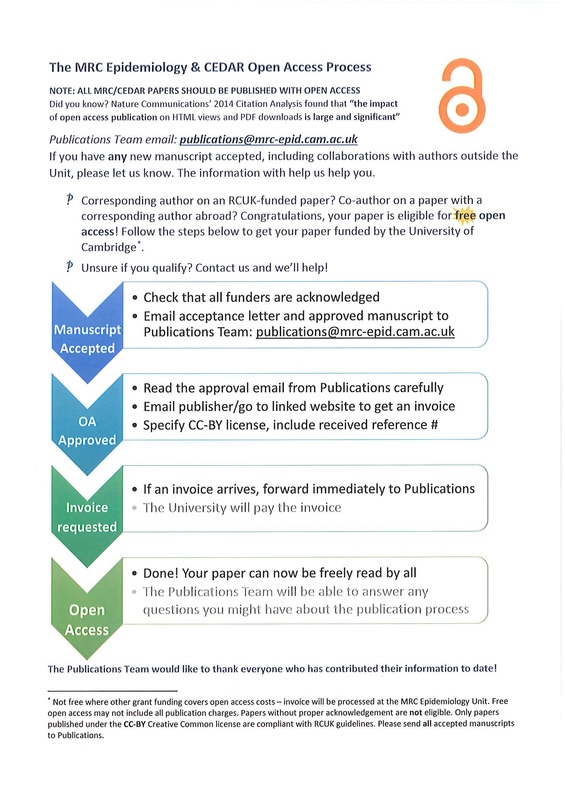 At Cambridge University, the Open Access team offers a centralised service to help our researchers make their work open access and comply with their funder requirements. But getting researchers to visit www.openaccess.cam.ac.uk and engage with the service is proving to be a challenge. We estimate that only around a third of the University’s journal articles are currently being uploaded within the three-month window allowed by HEFCE. We’re working hard to publicise the message at our end, but centralised services can’t reach all academics in the same way as their departments and colleges can. If we’re to ensure that as much of the University’s output as possible is available Open Access and eligible for the next REF, some of that work has to happen in departments. One of the most successful departments in the University is the MRC Epidemiology Unit, which currently submits more than 80% of its manuscripts on time. We went to talk to Signe Wulund, the administrator there who looks after open access, about what she does and the systems she uses. 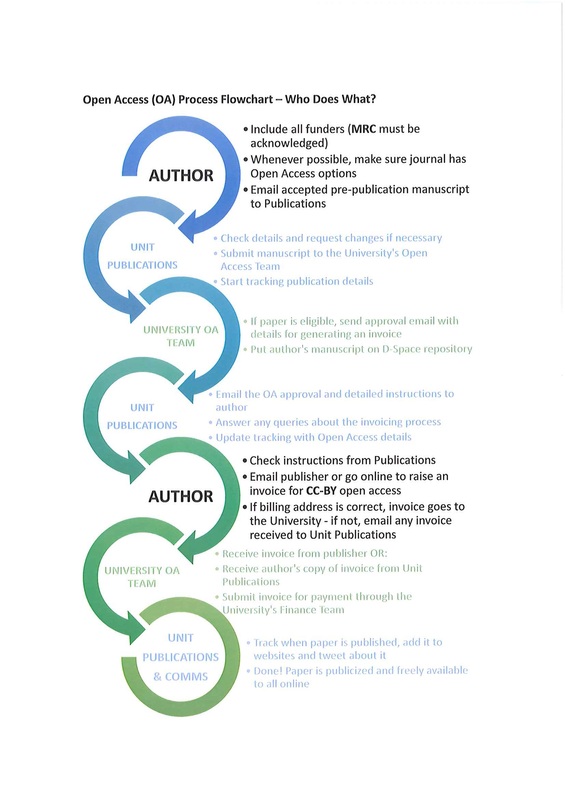 Click on the thumbnail below to open a high resolution version of the ‘MRC Epidemiology & CEDAR Open Access Process’. At the heart of her workflow is a detailed knowledge of what the department’s 120-130 researchers are publishing. Authors are encouraged to inform her of any articles accepted for publication and to send her their manuscripts. Frequent reminders in the form of posters, newsletter items and emails make sure they don’t forget. 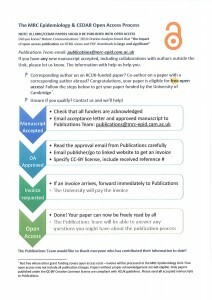 Papers can be uploaded to www.openaccess.cam.ac.uk by either the academics themselves or by an administrator on their behalf. Since 2013 MRC Epidemiology has had a great deal of success with either Signe or her colleague Karen handling manuscript uploads rather than the authors themselves. The expertise they have developed in the policies and workflows makes the process run extremely smoothly. They also check that the version of the article they’ve been sent is the correct one and that funders have been correctly acknowledged. This all means that by the time we received the manuscript, it’s exactly what we need and we can get back to them with advice and information on any payments as quickly as possible. The most valuable aspect to this approach, however, is that it allows Signe to keep centralised records of the department’s publishing output. She maintains a spreadsheet that tracks all the Unit’s known papers, including where they are in the publication process and their open access status. This includes both papers authors have directly notified her about and those which she has found later through other sources like Symplectic. 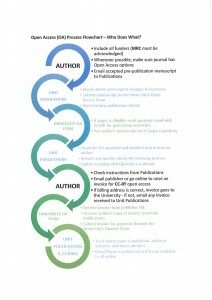 This has uses well beyond Open Access, but also enables Signe to maintain an organised overview of the department’s output and to chase up any issues that might arise; it also allows the department to follow up with journals and post manuscripts eligible for green Open Access to Europe PubMed Central. Open Access is strongly backed by the department’s leadership and made part of regular research group leader meetings, with papers included and discussed about open access performance. This maintains high awareness among researchers and allows group leaders to remind or inform colleagues who are not taking the appropriate action. This is the key advantage that departmental administrators have over a centralised service – the fact that they are a regular part of department life and can reach researchers more directly and more often than the Office of Scholarly Communication can, however many events or presentations we hold. There are, of course, resource implications. We know that many administrative staff within the University are overstretched. However, the time demands of the work Signe does on open access are not extravagant, and well worth the modest investment. Consistent administrators with responsibility for open access, working on it regularly and so able to develop expertise. Engage with researchers to keep track of departmental publications. Administrators upload articles to Open Access website to increase efficiency. Strong support from departmental leadership. Frequent reminders and publicity about open access, using a variety of means. Open access made a regular part of PI meetings, which can be used to increase engagement with open access. The impact such measures can have speaks for itself. The MRC Epidemiology Unit’s submission and compliance rates are more than double the University average. But the key thing to note is that such work also needn’t be especially burdensome from a time or resource standpoint. Of course, different departments have different organisational structures, publishing patterns and needs, but many of these approaches are common sense and applicable anywhere. If you’d like more detailed advice or suggestions for how to promote open access in your own department, please get in touch with us at info@openaccess.cam.ac.uk.